Are you someone who enjoys sword and sorcery? How about throwing around handfuls of dice, and hearing the satisfying clatter on the table? Or what about an abundance of words that begin with the letter “Q”? If you answered yes to any of these questions, then do I have a game for you! 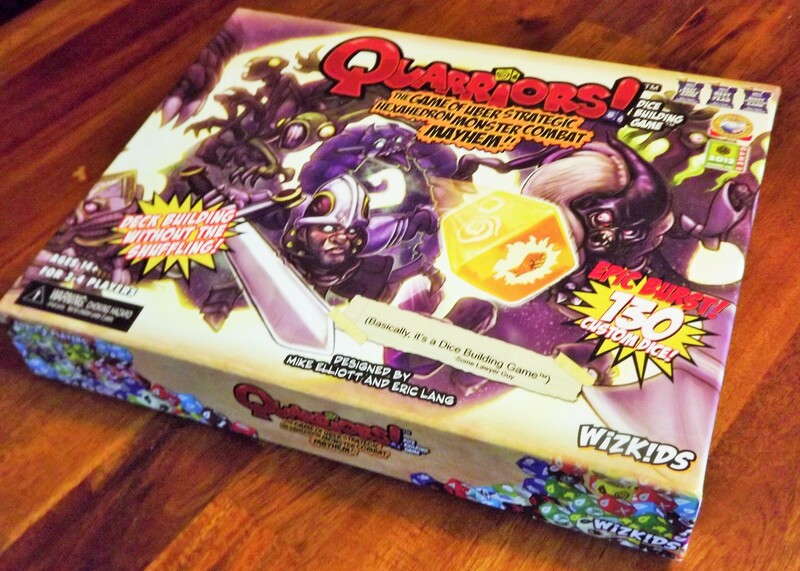 Quarriors! has all this and more. 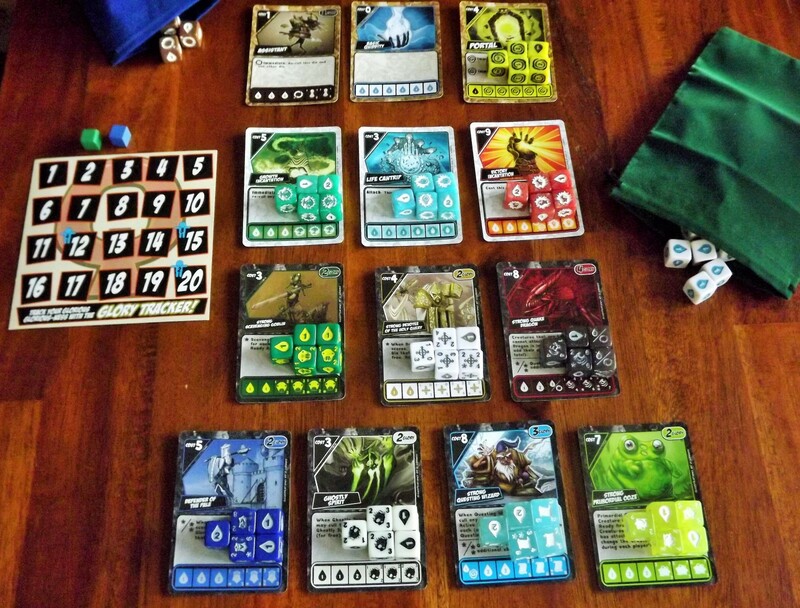 It is a dice pool building game that allows you to capture quarry such as dragons, wizards and goblins, and use them to attack your rivals on the field of battle. If this sounds like a good time to you, then there is only one more question that needs to be answered; will you take up the quest to become Quarriors! champion? Quarriors! can be played with 2-4 players. 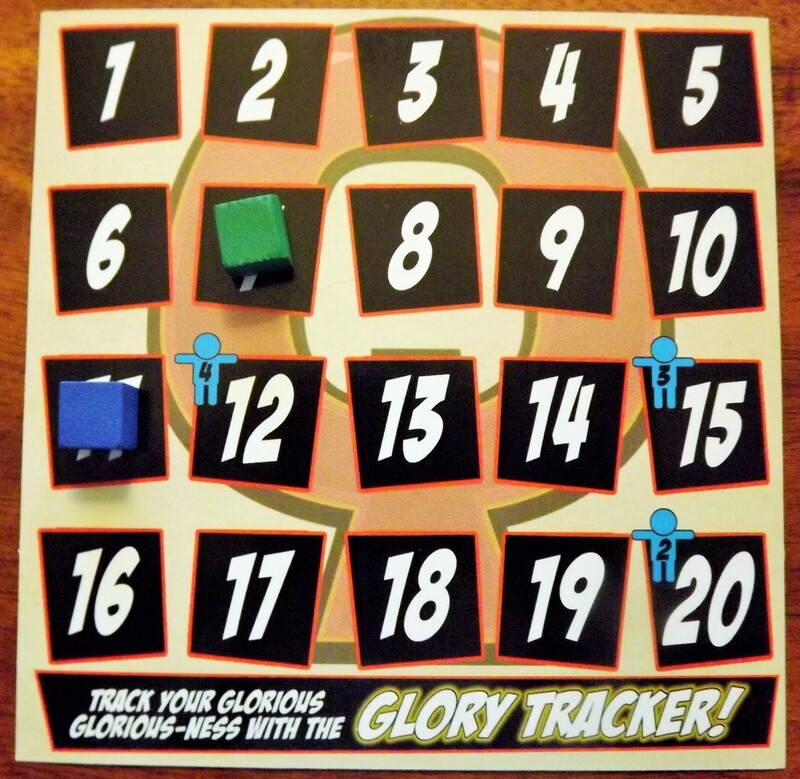 The object of the game is to be the first to get to 12, 15 or 20 victory points depending on how many people are involved. Just like a deck builder you start off with a set number of a certain type of dice that you roll and spend on other dice to add to your pool. You also have an option to cull dice that gives you a better chance of pulling those big monsters you have spent lots of quiddity (currency) on! Who will be the first to glory? The “wilds” set up uses cards for each of the seven creatures and three spells that are available to the players to purchase. They show how much they cost, how many victory points they score and what their special abilities are. 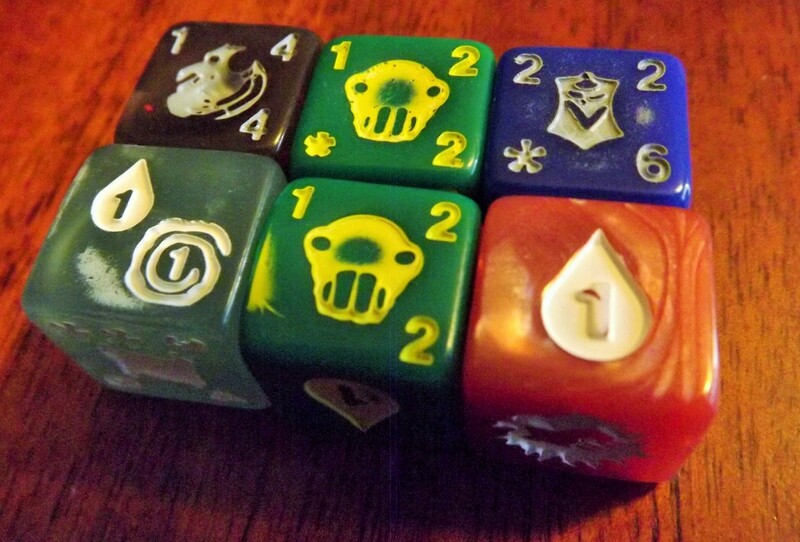 These abilities provide ways to deal more damage or manipulate parts of your turn; such as different ways to score or where your dice go after they have been used. They also have different levels of power that they do when certain faces have been rolled. At least one face shows quiddty, then there are level one, two and three faces. Each of these faces may increase the attack and defence of a creature, and it also increases the cost of summoning it. The higher level faces also have burst symbols. These symbols usually correspond to a different power the die may have. Into the “wilds” we go! Your turn consists of six stages. The first is to score any creatures you still have in your ready area. This step will be skipped on your first turn. When you score your creatures you move them to your used (discard) area. At this point you may also cull one die for every creature you have scored from your used area. 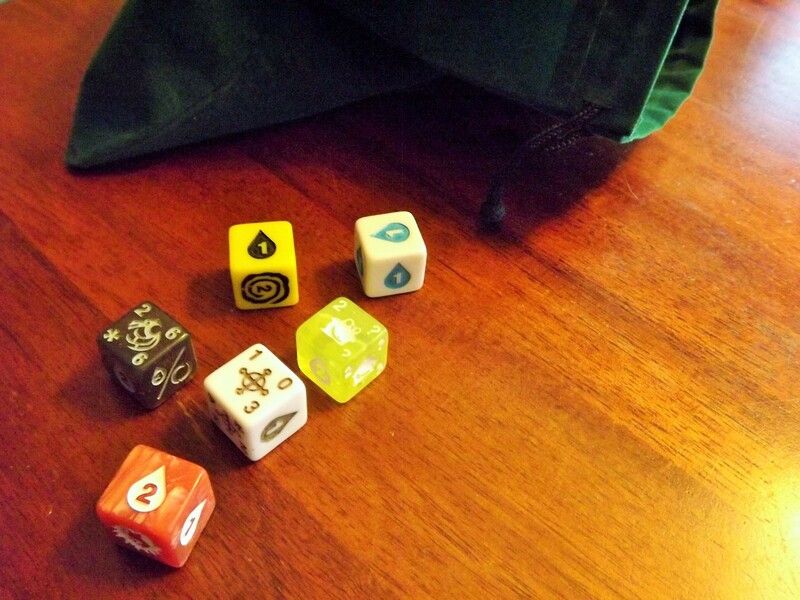 You then draw six dice from your dice bag and roll them. Once everything has been rolled (and re-rolled in some cases) you place them in your active area. From here you can now proceed to the next step and summon any creatures that you have rolled and cast any spells you might have. The spells are free to cast and move into your ready area and the creatures have a required amount of quiddity in order to summon them. This stage is optional as there is a possibility that no creatures or spells will be rolled. The next stage is to attack the other players’ creatures. You take your total attack across all of your monsters and your opponents measure that against their creatures’ defence. They can decide how much damage each of their defenders takes. No damage occurs to the attacker and each of your opponents gets dealt the same amount of damage. Your opponents then discard any creatures that perish during the attack. If you have some quiddity left over after the summoning stage you can now spend it to purchase one die from the “wilds”, which is where all the creatures and spells are placed during the set up, and place it in your used area. The last stage is then to move all of your leftover dice (except for any creatures and unused spells that you have summoned, they stay in the ready area) to your used pile and your turn is now over. Quarriors! is a quick and light game, with a fantasy theme. It plays in around 30 minutes which leads to multiple plays per game session. Nothing is more satisfying than chucking handfuls of dice onto the table, and with this game you get to toss around a lot. The mechanics are on the simple side, but it takes longer than it should to learn as the rule book’s layout isn’t that user friendly. Once you get them down though, there is not a lot of going back and forth to double check rules and it is easy to teach to others. After that there is very little downtime between turns as there is not a lot of re-rolling or decisions on what should or should not be kept before re-rolling. You only get to when a certain face on the die has been rolled. This game will resonate better with someone who likes dice and luck based elements for their games. There isn’t a lot of strategy involved, but there is enough that you feel as though your choices matter. For example, you need to choose what spells to buy and how you combine them with your creatures. You also need to decide on what or if you buy and whether or not you want to summon your monsters. There is also the culling system that allows you to get rid of dice to streamline your pool. Deciding to take advantage of this can lead to potential problems later on in the game. There was one point in a game that some pretty powerful monsters were rolled. This was much to the delight of the roller and the chagrin of everyone else. But, the roller did not have the quiddity to summon them due to all of the dice that he had culled. This is also where luck can enter into play and the frustration can kick in. If one or two of his monsters had rolled quiddity instead, then he could have summoned everything and scored some serious victory points. Luck can cause a lot leapfrogging in the scores, so you are never sure if the victory is secure. You can start out in last place, but overtake quite easily with a simple lucky roll on the right creature. This isn’t to say that I’ve never had run away games where there is no chance of catching the person in the lead. I’ve even had a game where I couldn’t score a single victory point, but this was a rare (thank goodness) occurrence. No enough quiddity to summon all my monsters! The “wilds” set up is done randomly so you never know what creatures and spells are going to appear. There have been games where all the creatures are low levels and can be purchased relatively easily at the beginning of the game. These games go by very quickly and are finished before you know it. There have also been games where all the creatures are high levels and it may take a while to get any into play. Here is where strategy comes into play. The game becomes one of grabbing portal dice, or spells that gain victory points before your opponents. The portals will allow you to roll more than six dice, which will gain you the ability to buy the higher levels of creatures. One of the things I didn’t enjoy about the game was the lack of player interaction. The most you will encounter is during the combat phase, where one player’s creatures are attacking and the defender’s either are destroyed or nothing occurs. The goal is to survive that encounter and it can get very repetitive. Most of your conversations will come down to, “I attack you for 5.”, and “I block with this creature and nothing happens (or It is destroyed)”. This may not sit well with some gamers, but for me it is enough that I will still have a good time. There is a bit of “take that” that happens when someone buys the last of a creature or spell that another player wanted, but no one is going to walk away with hurt feelings. Cheap card, two glory AND I get to put it into my ready area for free!? 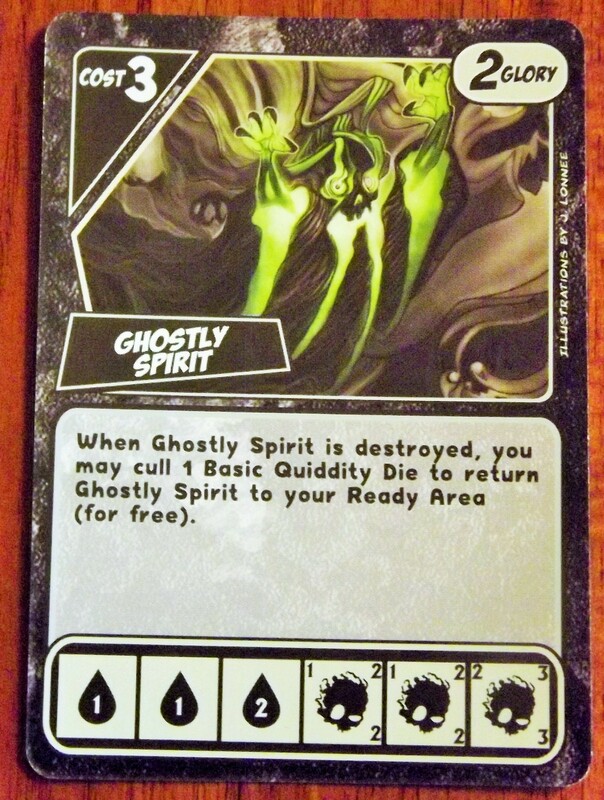 The text on the creature and spell cards is used to explain what each face of the die can do. This text is pretty tiny and may be difficult to read for some. For a dice game, it does rely quite heavily on this. If someone doesn’t quite understand what is written or cannot read it, it will slow the game down, as explanations of the cards will be required. You can learn and remember what each card does to bypass this, but this also creates another issue. There are many versions of each card, so while you may think you know what a certain creature or spell does, it may do something completely different. This happened to me while playing back to back games. I was all set to use my creature’s ability and it was pointed out that my creature didn’t have that ability. I was using its ability from the previous game! I now try to read the cards at the beginning of the game and decide which ones I would like to purchase. Then when I roll them, I re-check the card to see their abilities. I only do this once I have rolled, since if the monster decides not to show up, the ability and what I can do with it becomes a moot point. This way it speeds up the turns considerably as there isn’t any checking of each card before rolling. Small section of some of the poor quality dice that I received. The physical quality of the dice is where this game falls flat for me. I enjoy playing it, but the poor craftsmanship makes me cringe. Being a Heroclix player from the early years of the game, I knew that Wizkids wasn’t really known for their high quality. But, I figured with only having to design and produce dice, maybe it wouldn’t be a factor. Our first few plays of this game were of the first edition in the amazing tin box. Sure, the dice were just in a zip top bag inside, so there was no insert to speak of, but the tin was nice enough that it made up for that. We looked over the dice and they had nice vibrant colors with easily distinguishable pictures and numbers on them. We fell in love. It looked great, so we ordered it immediately. We couldn’t wait to play it again. We had to buy the second edition as the first was out of our price range, but I was optimistic that the quality wouldn’t change. I was mistaken. Almost all the dice that arrived were damaged in some way. The paint job was atrocious on most of them to the point where you couldn’t even tell what the numbers or pictures were. This made those dice essentially worthless. The paint was either smeared all over the face or non-existent so that everything blended into the background. The colors were dull and almost looked like all the dice needed to be washed to get them to sparkle like the first edition’s did. They were definitely not the same quality. I gave Wizkids the benefit of the doubt and returned the copy. Perhaps it was just a bad batch or some missed the quality control step. I went to a different provider and re-ordered the game. It came and this time only around 30 were significantly damaged. The wizard dice were actually slightly larger than all the other dice in the box! I went onto the Wizkids website and they have an on-line replacement system. I was able to get five of the most damaged dice replaced. If I wanted more than that I had to email them directly. At this point I had read that most of those emails go unanswered, so I took the five most damaged (one had a hole right through the middle) and got them replaced. Overall the replacements were better, but still not great. At least the new ones were usable. On a positive note, the large plastic insert is great. It has moulded rows for all of the dice so it is quick and easy to set up and take down. 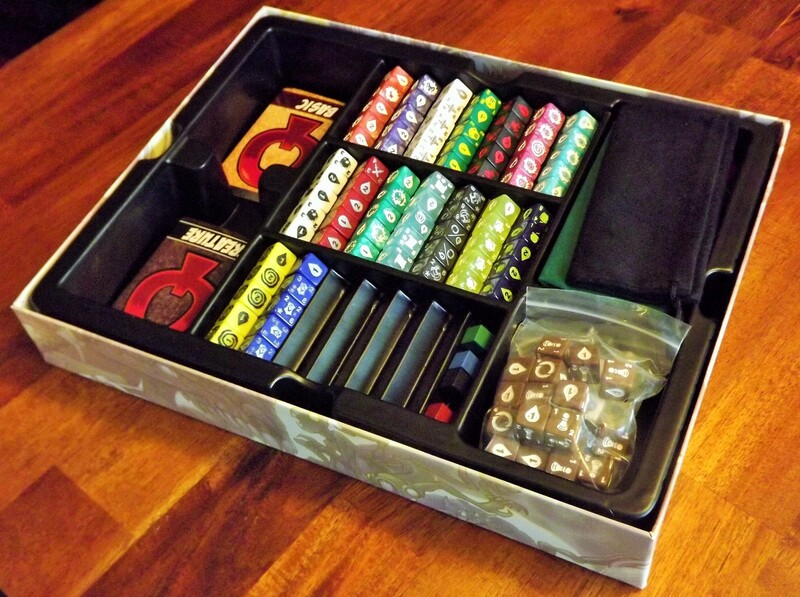 No more rummaging through the bag to find the right dice to put out. This eliminates around half of the initial set up time. The insert is so well designed that I wonder if they sacrificed their dice’s quality in order to produce it. Awesome box insert, but at what cost…. I find a lot of delight in this game. It can be repetitive after a few plays, but for a filler game that comes to the table around once or twice a month it is perfect and accessible. Everyone I have introduced to this game loves it and we always have great time chatting or creating complex back stories for our creatures while playing. It can get silly, but I don’t think this game takes itself too seriously. However, if dice and luck isn’t your idea of a fun time then this is one that should be avoided. There is way more luck involved than strategy but, it does play quick enough that the randomness can be ignored. You will be frustrated when the dice rolls cost you points, but it is over soon enough that you will want to try again and hopefully edge out a victory! Quick and easy to teach and play. Thank you for this excellent review. You helped me solidify my decision to pass on his game. I like dice and I need games I can play solo when my daughter tires of me (she’s my love in gaming partner since my husband hates board games), but the price point on this and its limited availability initially put me off. Your extensive comment about the dice quality was the last nail in the coffin.